It’s Day 2 of Domestic Bliss Week and while I can’t speak for everyone a warm mug of coffee is a requirement for all bliss in this house. Create a slew of felt coffee mugs and add some warm bliss to your holiday season. 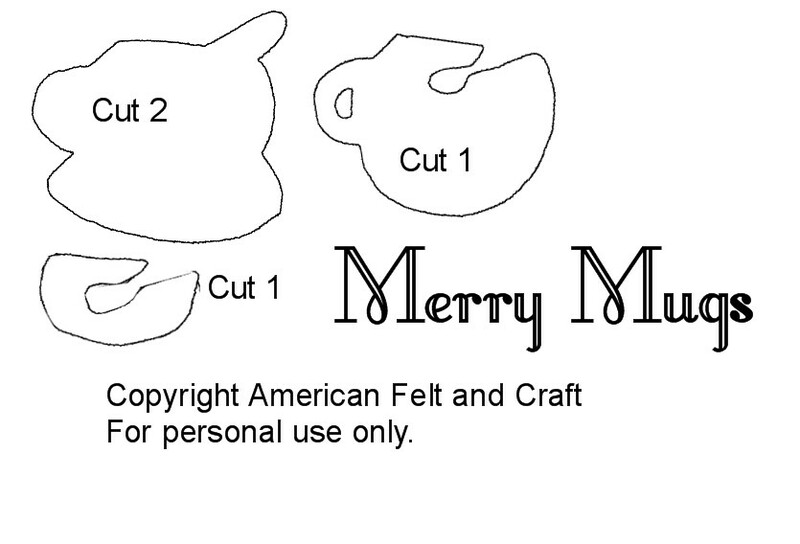 Cut 2 mug outlines from white and 1 mug from mug color of choice and 1 mug center from Hot Chocolate or Peanut Butter colored felt. Sew inner mug to outer mug with matching thread and an overcast stitch. Stitch all the way around the spoon cut out. Stitch mug to one of the white cut out pieces using an overcast stitch and matching thread. Add silver sequins to white felt of the spoon area hiding edges beneth the spoon cut out. Add looped over ribbon to undecorated white piece. Overcast stitch the two white pieces together.